I recomend these tires so far. However the real test is at the end of the tires life on whether they get bumps in them and uneven wear. My Prielli Scorpions were great till the end of their life, then they experienced the above failures before the tread was used up. Outstanding tires, especially considering the price. 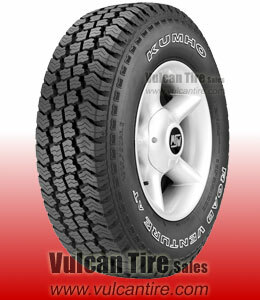 I have since purchased Kumho tires for my car. When I want to go, they go. When I want to turn, they turn. When I want to stop, they stop. If you have tires that do any more than that, I don't need them!! so far, I am really happy with these tires. Fantastic tire for a great price. Perfect for my 4x4 plow truck! Used 1 winter without the need for chains and still have 90% tread left. Will buy again. I absolutely love these tires! for the price you cant beat em I bought the 10 plys and I will say they hold up and last exceptionally longer than their brethren, my buddy has the same ones (but 6 ply on his jeep and has not got near the life out of them that i have of mine) but still a good buy for the price and definately not a bad tire in any case!